Just like that. Six months have flown by without a new blog post. Oh dear. I’ve been meaning to get back to the blog. So here I am. Almost a year ago, I shared that I had left the school counseling profession to restore balance to my life. And I did, sorta. For the 10+ months that I was not in a school counseling role, I focused a lot on transitioning my family into our new home, being a mom to my daughter, and figuring out my own self-care. But, I missed the work. About three and a half months ago, when I was good and ready, I rejoined the school counseling world. 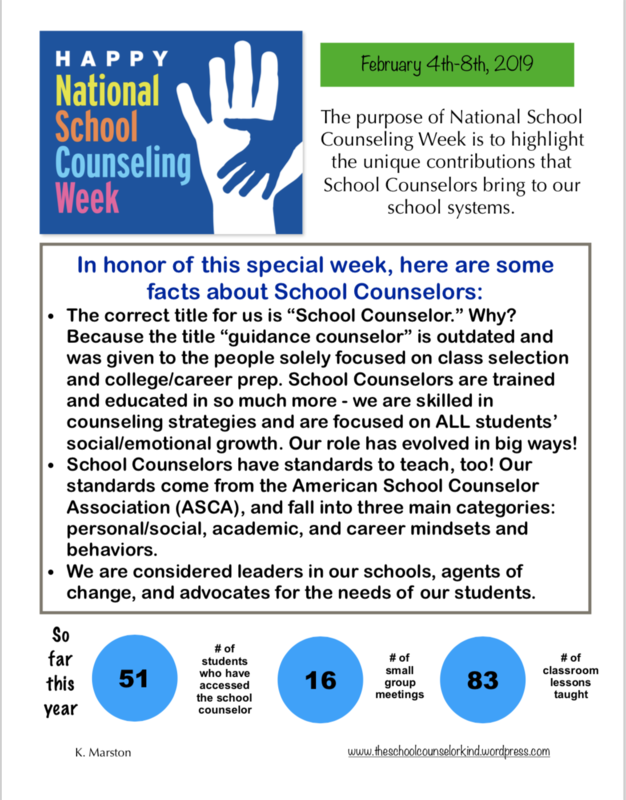 And what better way to celebrate than with a post about National School Counseling Week?! I almost overlooked it this year, but highlighting the work that I do is important, especially as a new person in my school. Combining information from a flyer I created in previous years, I decided to make a new one with just a tiny snapshot of the data I collect to showcase some of the services I provide our students. Being transparent about my data lets my staff know how I spend my time. I hope you all can find some small way to celebrate National School Counseling Week in your schools! Check out ASCA for daily ideas. I’ve been avoiding this. Over the last 6 months, I’ve had this conversation many times, with many different people. But to put the words into writing and publish them on my blog is a whole other thing. You can’t ever really know where your life will take you, or how one decision might impact another. But when a change is needed, things just don’t quite feel right until you land on a decision. You can have a good think, a good sleep, a good talk, and then take a step forward. My step forward was to leave the school counseling profession. I am still a school counselor. And I really, truly hope to return to the profession when I’m good and ready. But right now, I am putting family first, which means sacrifices that I never thought I would make. If you told me when I landed my first school counseling job that in 8 years, I would consider leaving the profession to be a better mom and wife, I would have laughed in your face. Seriously. My reasons for leaving are quite varied, but it boils down to balance. My life felt very out of balance and I needed to do something. So I did. I know not everyone understands my decision and that’s okay. What I understand is that this profession is really freaking hard and demanding, and I also understand that our current climate in education makes what we do even harder. I’m choosing to maximize my self-care (something I have always struggled with), and I can’t wait to see what things I will find along the way! As for this blog, it’ll still be here. I have lots of lessons I want to share and topics I want to write about, so stay tuned. The beginning of a new school year. A fresh start. It’s one of my favorite parts of the year! Teachers are refreshed and willing to try new things, and students are generally excited to be back at school. I’m starting this year feeling a bit weighed down by some heavy feelings, but with some self-care and a focus on the positive impact I can have, I’ll get there. Eventually. I made some updates to my office, as well as the program documents I use, and so I want to share them with you! The entrance to my office. I added the colorful lanterns (which are from my daughter’s 1st birthday party 😉 ). The table area of my room. I added the “Color Me” poster for students to color in when they visit. Shelves area showing the counseling tools and games that get used quite often. And finally, I updated my student referral form. Previously, I had students check off if they needed to meet about a small or big problem, and that language just wasn’t working for me. Instead, I added options that students might need to meet about to help guide their thinking and self-advocacy. I print these, cut them, and keep them in an envelope in the mailbox on my door for easy access for students to take as they need. Click this link to see the form: Student Referral Form. Being a blogger can sometimes come with some pretty cool perks. When I am sent the latest Julia Cook book, FOR FREE?! That’s the best. And when I’m asked to do a review and giveaway for my readers?! Even better! My school counselor library boasts quite a few Julia Cook books already. She is one of my go-to authors to creatively address many social-emotional learning topics. Her latest book, Bubble Gum Brain: Ready, Get Mindset…GROW!, discusses one of my favorite SEL topics – growth mindset. I believe that teaching growth mindset explicitly is crucial for our students. I cannot wait to add this piece of literature to my future classroom lessons! In her usual creative fashion, Julia Cook uses two characters – one with a bubble gum brain (representing growth mindset) and one with a brick brain (representing fixed mindset). Readers will quickly see that having a bubble gum brain, one that can flex, stretch, and expand his/her thoughts, leads to a lot more fun and a lot more learning! While I love bubble gum brain’s antics, I must say I have a soft spot in my heart for brick brain, who reminds me so much of many of my students, who struggle with new things and hold onto fears that block their growth. I know they will be able to relate to this character. My favorite pages in the whole book are page 10 and 23, because both talk about THE POWER OF YET. I use this language with my students already, and this book will naturally fit into the conversations I am already having. Another powerful message in this humorous story is that having a growth mindset is a choice! The words colorfully show that all of us can choose to stay stuck in our negative thoughts, or we can choose to try, make mistakes, and learn how to be hopeful. What an important, life-changing conversation for our children to have! What I like most about Bubble Gum Brain is the way Julia Cook uses adventure and fun to draw young readers in, while teaching a critical social-emotional skill – growth mindset – in a very real, life-like way. I can already see so many uses for this book, including classroom lessons, individual “booster” sessions, as well as guiding parents to help their own children develop growth mindset using the convenient “Tips for Growing a Child’s Mindset” in the back of the book. If you are interested in receiving a free copy of Bubble Gum Brain for your own library, please comment below with how you would like to use this book with your students. All entries will be accepted until 11:59 p.m. on July 10, 2017. One winner will be chosen.